The New York Knicks have missed the playoffs 13 times since the 2001-2002 season, haven’t won a title in 45 years, and are likely to fall short of glory this season too. But for the first time in nearly two decades, the ailing basketball team's future looks bright. The Knicks have been stuck in a myopic ‘win now’ mode for years, eager to sign just about any big name regardless of fit. The team’s new management – led by General Manager Scott Perry, appointed in July 2017 – have a more compelling vision for success. 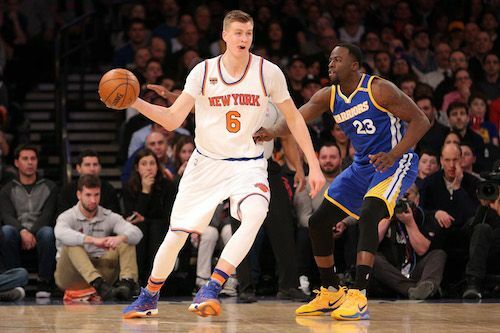 Unlike his predecessor, legendary Chicago Bulls coach Phil Jackson, Perry plans to develop young talent while building around potential superstar Kristaps Porziņģis, the 7-foot-3, 22-year-old Latvian who's currently injured but should be back in action early next year. This offseason, Perry fired head coach Jeff Hornacek, who scraped together just 60 wins in 164 games over the last two seasons. His replacement is David Fizdale, the lead assistant coach of the Miami Heat when they reached four league finals between 2011 and 2014 and won two of them. The importance of team coaches is often overstated, but Fizdale has proven he can squeeze the best out of top players such as LeBron James and Dwyane Wade, win championships and build a great team culture. Young players are also more likely to respect and listen to a man with his reputation - something the Knicks were missing under Hornacek. Fizdale's presence could also make the Knicks a free-agent destination in the summer, when superstars such as Kevin Durant and Kyrie Irving will be available. Perry is already transforming the team to match his vision. He’s let go of veterans such as Michael Beasley and Jarrett Jack and looks set to buy overpaid relic Joakim Noah out of his contract soon, freeing up funds for the new season. He’s signed young, talented players such as Mario Hezonja and Noah Vonleh on short-term contracts. The Knicks have also secured Kevin Knox, potentially the steal of the draft: he averaged 21 points and seven rebounds per game during the summer league. These new players should complement Frank Ntilikina, Damyean Dotson, Emmanuel Mudiay and Trey Burke, all Knicks players who offer significant upside at minimal risk - their affordable contracts won’t constrain the Knicks’ buying power. Knicks fans should be encouraged by the recent developments. For the first time this millennium, their team’s management seem to have a coherent approach. The Celtics, 76ers and other franchises have shown how a rebuild can turn a lottery team into a title contender. Moreover, the departure of James to the Los Angeles Lakers should make the Eastern Conference more competitive. Yet Perry and Fizdale can't be expected to deliver instant riches with a young, inexperienced team - bookies in Las Vegas have the Knicks at an uninspiring 8/1 to make the playoffs. The pair should focus on developing young players, settling on a system, building team chemistry and instilling a winning mindset this season. If successful, they have a good shot at securing a superstar next summer and putting New York back on the NBA map.